Juicing – Healthy and Great Tasting! Ok, I realize this post is a bit off-topic…again…but I just couldn’t contain my excitement. I received a Jack LaLanne Power Juicer for Christmas and was anxious to share my newly acquired knowledge. That being said, a guru, I am not! I’m still a newbie in the world of juicing and I have a lot of learning to do. It’s not as easy as it may at first appear but it’s definitely worth the time. I can’t tell you how much better I feel since drinking just one glass of fresh juice per day. I even find myself craving the newly discovered flavors and I have never been a vegetable lover. My mom used to jokingly ask how I could call myself a vegetarian without eating any vegetables. My diet was maybe healthier than the average person’s but not by much. The inspiration for delving into the world of juicing was triggered by a fairly recent decision I’d made to eliminate all animal based foods from my diet. I’d been a pseudo vegetarian for years, eating no meat at all but never having the discipline to completely eliminate one of my favorite foods, fish, from my diet. My reasoning was that since fish lived an essentially “natural” life up until they were caught, their suffering was minimal and short-lived. In my distorted view, this made it morally acceptable to eat fish, or at least better than eating captive animals. This rationale, of course, doesn’t take into account the environmental impact of commercial fishing, etc., but up till now, I’d decided to ignore these pesky details. The film Forks Over Knives gave me the final push I needed to give up all animal based foods, including dairy, completely. This decision initially created a huge dilemma that loomed awkwardly before me. The problem was, I couldn’t stand to cook! In other words, a “Foodie”, I was not! How and what the heck would I eat? So I dove clumsily into the world of Veganism and subsisted largely on cereal with soy (or rice) milk, curried rice and lentils, lots of humus, apples, oranges and bananas. While watching yet another documentary film, Fat, Sick and Nearly Dead, a revelation began to form. The subject of the film had decided to consume nothing but what came out of his juicer, for about two months, in order to detoxify his body and lose weight. The juicer seemed like the answer to all my problems. Not only would it add the nutrients I’d been lacking, but it looked fast, easy and didn’t appear to require many bowls, dishes or utensils that I would later have to wash. My husband and I vowed to get one. After Christmas was over and we were back in our own home, we excitedly ripped open the box and stared at the very complicated looking, shiny, machine. Notes and stickers all over the box and machine stressed reading the instructions before proceeding any further. This seemed to make good sense considering we could barely tell which way was up. After using the juicer almost daily since then, I can agree that the instructions, most certainly, must be read, no matter how tempting it may be to start shoving apples down the chute. 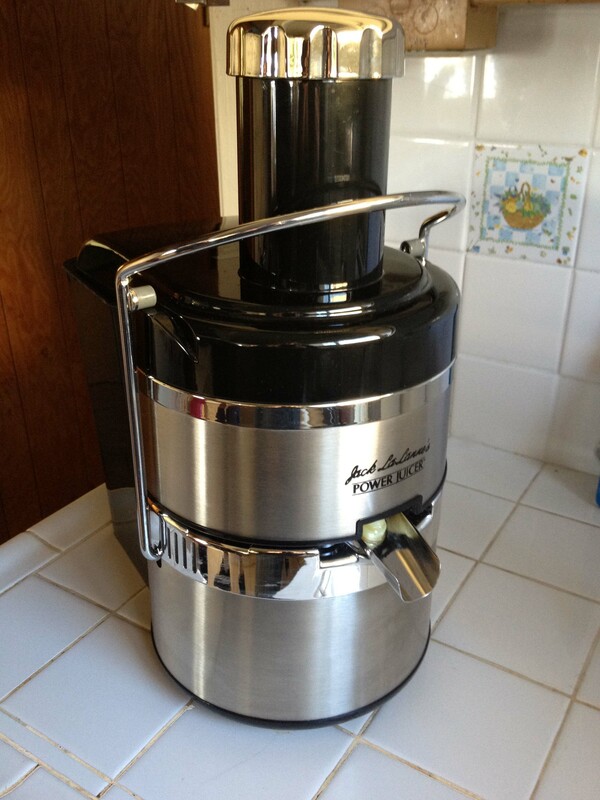 The Jack LaLanne Power Juicer is the first and only juicer I’ve used so I can’t comment on how any other juicers work. Here’s some of what I’ve learned so far. Fruits and vegetables produce varying ratios of juice to pulp. For example, apples produce a lot of juice and not very much pulp while a carrot produces a small amount of juice and leaves quite a bit of pulp behind. Pulp??? – you ask? What the heck is that? I had a very similar reaction. After trying a couple of the recipes in the book the juicer came with (which were amazingly delicious), I looked into the pulp bin and asked myself, what do I do with this stuff ? I went online but didn’t really find what I was looking for. All the pulp left over after making a nice tall glass of juice presented me with quite a dilemma. I have a compost bin but this was too much to simply “throw away” especially considering how expensive produce is now. I had to find a purpose for this pulverized produce. My first idea was to try separating the fruit pulp from the vegetable pulp by using plastic bags in the bin and switching them so that only fruit landed in one and only veggies in the other. I figured I could at least mix the apple pulp with my oatmeal in the morning. I spooned the first batch of separated apple pulp onto my oatmeal the next morning and could barely get it down. It tasted awful! As I rooted through my cereal, I found that there were pieces of green bell pepper, that I’d juiced earlier, mixed in with the apple. For a moment I was puzzled as to how the pepper got mixed with the apple but I took a closer look at the machine and quickly realized that the pulp ended up all over the inside of the machine and not just in the pulp bin. The solution to this problem is to always juice fruits first and before replacing the bag, scrape the inside of the lid and filter with a rubber scraper to remove as much of the fruit pulp as possible. The next morning’s oatmeal tasted great! After juicing the apple, I place the bag in the fridge and just spoon it onto my cereal the next morning. In my next post: What to do with vegetable pulp?